This agreement is for the sale of shares in a private company in any industry for cash. It includes a less extensive selection of warranties than other shares sale agreements we offer, making it suitable for transactions where the risks to the buyer are lower: such as when the buyer is familiar with the company, or when the seller is trusted. This document is for use by a buyer of shares in a private company in circumstances where the buyer does not require the full protection of detailed warranties. Whether transfer of control of a company takes place by a transfer of all the shares, or less than all of them, the buyer knows far less than the sellers about the company. So most of the substance of the legal agreement consists in warranties. Of those warranties, those relating to real property - land and buildings - are likely to be most important. However, sometimes buyers do not need to rely on detailed warranties. This document is drawn for such an occasion. shares change hands within the existing body of shareholders and directors, such as on a management buy-in by a director, or on sale by one shareholder. you are buying from a close friend or relative whom you trust absolutely, and you may not think it appropriate to tie that person down to the extent of a massive slate of detailed warranties. the risk of overstatement or understatement of assets or liabilities is low. the company is being sold to another company in the same group in a reorganisation of group structure. A warranty is a promise that something is as it is described, and which, if untrue, can allow the side relying on that information to seek compensation. Warranties are used primarily because they protect the buyer, who does not have the same information as the seller about the company as the seller. However, when the risks are lower: such as when buyer knows the company or trusts the seller, warranties are less useful. In this agreement we provide warranties as to title, general background, accounts, cash flow, taxation, and assets. You can choose whether you want each to be given or not. Sellers will, obviously, want to limit the warranties given. 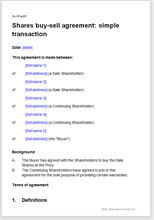 This agreement is for the situation where the buyer purchases the shares of an existing shareholder. If you require extensive warranties, our longer share sale and purchase agreement contains these. Sometimes, you may want to change relative ownership proportions at the same time as the sale by subscribing to newly issued shares. For example, you may buy the shares of a departing shareholder and then invest additional equity to obtain a majority shareholding. In that case, you will need a Share purchase and subscription agreement. Alternatively, you may be just want to invest alongside existing shareholders. In that situation, you need a Share subscription agreement. We also sell a simple shares subscription agreement for uncomplicated transactions that don’t require the warranties that the other documents have. "I appreciate your patience. I have to say though it took me a while (I had almost given up) to come across your internet site, but I was quite impressed with the manoverabilty of the site itself and the services it offers. Normally I am very cautious about internet services and am pleasantly impressed by you professional response. Without doubt I will defintely be recommending yourselves to others."